The team at Bricault Design has created a stripped down, open space reminiscent of a 1920’s opium den. Exposed brick and wooden beams are complemented by a silk entry way, resembling the interior of a Chinese lantern, and a dragon-skin inspired ceiling installation made of wooden scales. The focal point of the room is an 18 ft bar housing a variety of local craft brews and imported Asian beers, a small selection of wines by the glass, and an assortment of cocktails derived from classic recipes rejuvenated with smoke and Asian flavours. About Fat Dragon Bar-B-Q: Where East Meets South! 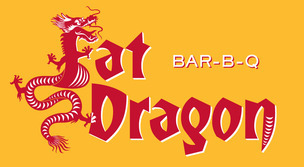 Fat Dragon cooks up bold American southern barbeque complemented by delicate Asian flavours. Dine in or take out. Located at 566 Powell Street., Vancouver B.C., Fat Dragon is open from 11:00am – late, seven days a week and guests are encouraged to drop in unannounced. For more information email info@fatdragonbbq.com, visit www.fatdragonbbq.com, follow@fatdragonbbq, like www.facebook.com/pages/Fat-Dragon-BBQ and call 604-558-0880.